VersaTune is proud to be an authorized vendor here on rx8club.com. We recently launched support for Series I RX-8 and have had support for Series II for over 3 years. Why the long delay in supporting Series I? We (foolishly) assumed that the market was well served by existing solutions. Over the years, we received so many requests to add support for Series I, that we decided to commit the resources and make it happen. Please feel free to ask us any questions you may have. We look forward to working with everyone here to make a great platform even better. In a nutshell, VersaTuner is software (Windows application) that can connect to your car and change the way your engine operates to give you more power, better fuel economy and greater control. How do I use VersaTuner? Install VersaTuner application on any Windows PC/laptop/tablet. Connect it to your car by plugging one end of the VersaLink USB vehicle interface (or compatible J2534 interface) into a USB port of your computer and the other end into the OBD-II port located near the steering wheel of your car. Run VersaTuner and follow the on screen instructions to reflash your ECU. Disconnect the USB cable and enjoy the extra power of your car. The changes persist in the ECU, so you don’t need to keep your laptop/tablet connected. What else can VersaTuner do? Easy to use: all-in-one application for all your tuning needs with intuitive and well documented user interface and easy-to-follow wizards that guide you through the process. No need to remove the ECU, splice or solder any wires. Affordable: no need for costly custom hardware, all you need is an off-the shelf USB vehicle interface, the software can be installed on any regular Windows laptop/tablet/PC. 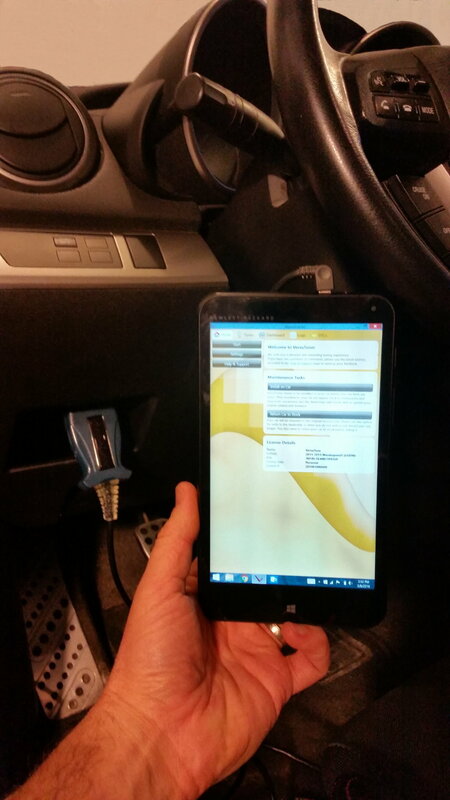 Wireless monitoring/logging: use a Bluetooth vehicle interface and monitor the performance of your car on a big, full-color touchscreen of your tablet with no wires hanging under the dash. Forget about squinting at small low resolution screens found in other products. Great support and community: we give personal attention to each of our customers and do our best to solve any issues as soon as possible. We are also active members of the car enthusiasts’ community, we listen to feedback and keep adding features that are most wanted. Read more about VersaTuner at www.versatuner.com and check out our user support forum at www.versatune.net/forum. Last edited by [email protected]; 05-02-2017 at 10:20 PM. I'm willing to consider it, but after reviewing whatever info I can find on the RX8 there's just too many generalizations and not enough detail on what maps, codes, etc. that are actually covered. I need to know what your actually providing and capable of. I don't see any of that anywhere. We are currently developing a performance tune for stock cars. We appreciate the highly educated and technical nature of RX-8 owners. We are not trying to BS anyone. Our tunes are all unlocked and fully editable. We're not going to put a degree of timing across the board and call it a performance tune. A quality tune takes time on the dyno and the street. We wanted to get VersaTuner in your hands as quickly as possible as there are many here who are very capable of creating their own custom tunes. There are not big gains to be had on stock cars. Mazda did a lot of work on the calibrations to get emissions, fuel economy, and reliability under control. The result is dozens of calibrations per model year and geographic market. We support all configurations. 4port, 6port, auto, manual. Due to the high number of different factory calibrations in the field, there are still some calibrations that we have not created definitions for, so there is a chance that you may get an unsupported message on initial install. We are able to add support for new calibrations in a few days. Most people like the ability to adjust fan trigger temps and MOP injection. Launch control and no-lift-shift are nice for track use. If you find anything that isn't working as advertised, we will fix it. You may find us a hard nut to Crack so to speak without some more info. It sounds like a good program from the available info.....BUT we have dealt with more than a couple of previous software developments that cost a lot and didn't pan out at all. And have been flash tuning these cars for about 10 years. We do know that an off the shelf tune for the RX8 doesn't really do much. I'd also be interested in what maps/codes etc this would have available for modification. I currently use the Cobb, and while I'm not as advanced as the two previous guys here, I definitely feel comfortable tuning and calibrating on my own to meet my modest needs. Basically, I think a good question that 8 owners will ask is: will Versatuner do what the Cobb with ATR does? If it does, I'm in, and I'm sure you'll get more to follow. If it doesn't you'll have a hard time finding people to jump ship that already have their solution. I've never used ATR for RX-8, so I can't make a direct comparison. Well, this looks like all of what I use. I'll have to confirm with my notes at home, but this looks really promising for me. Any chance of a Linux build in the future? I use Linux as my primary OS, so I feel your pain. I use VirtualBox and a Windows 7 VM. We have seen some bricked ECUs (which we helped people recover from) from people using Macs with VMware, so we can not officially support use of VMs. We only officially support a bare metal windows machine for flashing. With all of the cross platform development tools, it may happen eventually, but I won't commit to any date on that. We will more likely support mobile OSs than Linux. Last edited by [email protected]; 05-04-2017 at 03:09 PM. This is a little selfish of me, as I'm in the middle of trying to stuff a raspberry pi 3 into my stock nav hood. So it would be cool to do some analysis in car, while having the OBDII hooked up to the Pi. I use windows everywhere else, including my job, so it's not like it's a real issue for me. I figured I would bump this thread instead of making a new one. Ive searched and there doesnt seem to be much information on VersaTune since the recent S1 launch. Has any of the Tunes that were under development been finished and available for download yet? Ive checked the site and the only tunes available are Valet and Economy. I'm ready to pull the trigger on thr Software/Hardware but would like to see if any of the dyno's/Maps from the developers tunes are available as of late. We launched support for ND Miata recently which took a lot of resources. We are working with some RX-8 testers on a performance tune and are also working on sourcing a test RX-8 for the shop to speed up the development process. Thanks for the information! I'll keep my eye out for updates in the forums and look forward to doing business in the future. where are ya'll located at? I'm sure someone on the forum wouldn't mind being a local test vehicle if they were near your home facility. Steve, any plans for flexfuel capabilities? We have a long term plan for a flex fuel sensor. We have another hardware project in the queue ahead of it right now. I'm going to buy a tuner this week and am most intrigued by the Versatune. I've been poking around the interwebs and would like to know if you have a kind of primer for beginners. Also, it says you have an "online tune database" but I only see two mentioned. Are these the only starting points or is there more I'm not seeing? VersaTuner allows full custom tuning. The included tunes are intended to be used as a starting point for self-tuning. We will add more tunes in the upcoming months. We are working on acquiring a new dyno which will make building new tunes a lot easier. There is also a new update coming out very soon. Lastly, we are beta testing table axis re-scaling which will allow proper tuning for boosted applications. This is the reason I'm looking most seriously at VersaTuner. If you're actively growing and working on my application, I'm in. I'm catless, so at first I'm going to just be interested in coping with that (leaning out a bit, killing the cel). But I'm a mechanical engineer and incurable tinker-er, so the tool will be hard to resist. I'm super conservative, though, and care very much about longevity of my engine. So I'll be keeping an eye out for proven tunes. If they're dyno tested, I'll listen! I just recently purchased and installed the VersaTuner software for my S1 and can say that I am incredibly impressed at the amount of fine detailing that they offer. Previous experience with AccessPorts has always been pleasant but this is a step beyond. I'm not going to lie, the extensive list of adjustable parameters is a bit daunting to someone with little tuning experience but I definitely look forward to upcoming file releases. For now I am thoroughly satisfied making minor tweaks and adjustments to iron out my modified S1's current situation. If any of you are considering a custom tuning solution, I highly suggest you spend your money on VersaTuner. Thanks for the kind words! We've got some interesting stuff in the pipeline. It's going to be a really exciting summer. Mamam mia ... can't believe you didn't already have this ! AS someone who has built, tuned, and made many custom wiring harnesses on megasqurt stuff, I like the idea of getting a versatuner for my own vehicle. Disabling sensors, and setting up desired ignition tables for ignition and AFR target ratios on the stock ecu sounds good. Data logging at the track and getting the VE on target is my idea of a fun day. Is Versa Tuner able to bypass limp resulting from an OMP issue?